HER-2 is probably the most targeted molecule in today’s pharmaceutical industry, thanking to the clinical success of Herceptin®. Many investigational anti-HER-2 mAbs are being developed. There is a growing need for a standard assay that can be used to facilitate the study of their pharmacokinetics. The enclosed ELISA assay kit for anti-HER-2 h-mAb in mouse serum is based on an enzyme immunoassay (ELISA) between recombinant HER-2 protein (ECD) and a biotinylated anti-HER-2 monoclonal antibody. The method employs the principle of competitive ELISA, allowing quantification of monoclonal anti-HER-2 antibodies in mouse serum. There is no requirement for the species and subtype of the antibody. Inhibition of HER-2: biotinylated anti-HER-2 antibody binding by an anti-HER-2 antibody. 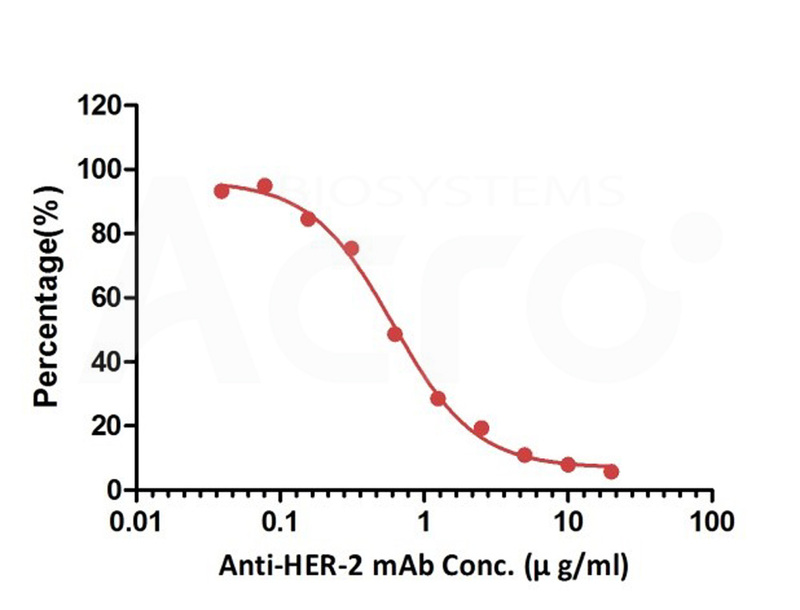 Serial dilutions of the Therapeutic Anti-HER-2 Antibody (1:2 serial dilutions, from 20 μg/mL to 0.039 μg/mL) was added into HER-2: Biotinylated Anti-HER-2 Antibody binding reactions.